Among bathroom enthusiasts, there’s a common debate about the one-piece and two-piece toilet. Though most homeowners prefer a one-piece toilet over the older two-piece type, there are plenty still who prefer the latter. The number one reason behind this is because two-piece toilets are much cheaper compared to their one-piece counterparts. They appeal to buyers who are on a tight budget or those who are content with basic toilet features. The second reason is customization. Two-piece toilet types give the buyer more options for height, style and rough-ins. Third is shipping. Shipping costs of two-piece toilets may be considerably lower. This is because one-piece toilets are significantly heavier and two-piece toilets can be uncoupled, making them easier to move. Fourth is the freedom to combine designs. If you wish to, you can mix and match different colors or styles of tanks and bowls. Finally, it can be argued that the flushing and water saving options of two-piece toilets are slightly better. Well, if you are looking for a beautifully designed two-piece toilet, I believe the TOTO Entrada Elongated Toilet will be able to meet your needs. It is actually one of TOTO’s most impressive toilets. Without further delay, let’s take a closer look at this TOTO Entrada Elongated toilet review to see why this model is getting a lot of reviewer admiration. Please keep on reading below. Faithful to the TOTO standard, the TOTO Entrada Elongated Toilet (CST244EF) features an E-Max flushing system that can remove a huge waste bulk in a single flush. E-Max makes possible a quiet yet powerful flush of 1.28 gallons. It reinforces TOTO’s performance reputation while offering an additional water savings of 20%. The low volume flush maximizes power to remove waste as efficiently as possible, conserving a lot of water. All of this is possible because of its wide 3″ flush valve that provides a quick, consistent and powerful flush. Are you aware that old toilets can consume an average of three to seven gallons of water per flush? And with all that water, it still clogs! The intelligent E-Max flushing system preserves water by using a large valve and extra-big siphon jet. To repeat, the TOTO Entrada Elongated Toilet will only consume 1.28 gallons per flush and you will never need to flush it twice. Utilizing the same proven engineering as their legendary 1.6 GPF G-Max flushing system, this unit accomplishes more with less water. Yes, the TOTO Entrada Elongated Toilet is truly efficient. Just imagine the amount of water you can save in a year! That translates to big utility bill savings. What is more, not only does it use less water, but it also refills at top speed. TOTO gave this toilet a very modern appearance with a great style that looks cozy and smooth. The nice-looking chrome trip lever also caught my eye. I think the TOTO Entrada Elongated Toilet is very well planned and designed. It is also made of high quality durable materials to ensure that it lasts for many years. 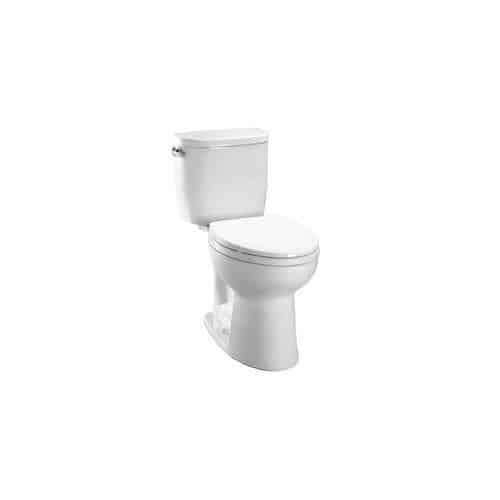 Moreover, this toilet has a Universal Height feature which gives more comfort across a broader range of individuals. This takes into account people of all ages and abilities, so that everyone’s bathroom experience is comfortable and accessible every time. It makes standing and sitting easy, so it is ideal for seniors and people with disabilities. And finally, its elongated bowl shape offers more sitting area and convenience for its users. WaterSense– A program sponsored by EPA, seeking to protect the future of adequate water supply by promoting water efficiency and inspiring the market to create water-efficient products. ADA -Improved comfort for people in regards to sitting and standing up. This benefits taller people, those with physical handicaps and the elderly. Proposition 65 – Complies with California Proposition 65 warning requirements. Proposition 65, also known as the Safe Drinking Water and Toxic Enforcement Act, was made in 1986. It helps consumers make wise decisions about protecting themselves from chemicals known to cause bodily harm. CalGreen – TOTO has always been in the forefront of green technology. They offer products that meet the revised California Green Buildings Standards Code (known as CalGreen). These include showers, toilets, flush valves, urinals and faucets with top-notch performance. TOTO Drake is another impressive Toto two-piece toilet that matches very well with the TOTO Entrada Elongated Toilet. For one, both toilets use a siphon jet flushing action. 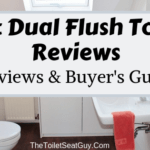 Both toilets have a quiet, powerful, commercial grade flushing performance. And just like every Toto product, both have a fully glazed finish that repels mold, debris and bacteria which decreases regular toilet cleaning. In effect, you will consume less water and chemical cleaners, translating to more money savings. What is more, they both comply with the California Proposition 65 warning requirements. Both also feature a contemporary, high profile design that will look splendid on most bathroom styles. Both of these toilets are good solid choices and have been popular with consumers. Either one would be worth considering. Both the TOTO Entrada and Toto Eco Promenade utilize the highly efficient E-Max flushing system. This efficient E-Max flushing system conserves water by using a bigger valve and a larger siphon jet. In addition, they both meet the strict EPA WaterSense toilet standards. Lastly,they feature a Universal Height which makes everyone’s bathroom experience as comfortable as possible. When it comes to price, the TOTO Entrada Elongated Toilet is significantly less expensive than the Toto Eco Promenade. Also, they come with the same stately design. In the cleaning aspect, the Toto Eco Promenade is empowered with CEFIONTECT but the TOTO Entrada lacks this feature. This makes the Toto Eco Promenade much easier to clean because its ceramic glaze helps keep the bowl cleaner for a longer time. The Toto Rowan is another reliable Toto model and it has very similar specifications to the TOTO Entrada. Just like the TOTO Entrada, the Toto Rowan also features a powerful low consumption flush. It also comes with a universal height plus an ADA compliance. The Toto Rowan is a fitting alternative to the TOTO Entrada Elongated Toilet for those on a tight budget. Where the Rowan comes out on top is that it is a dual flush toilet. The Rowan uses a Dual Max flushing system that allows you to chose between a 0.9 and 1.6 gallons per flush. So you might even use less water with this model. The TOTO Entrada is a budget-friendly model which has been popular for many years. 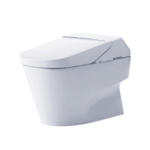 Its affordable price, attractive design and water saving, powerful flush has stood the test of time. A new toilet is a long term addition to your bathroom. Get something that will satisfy you for many years to come. If you seek a pleasant, powerful and water-conserving toilet, the TOTO Entrada meets all those criteria. With such exceptional specifications and features, this toilet is easily one of TOTO’s finest products. With this in mind, I hope you found this TOTO Entrada review helpful and it will make your shopping experience a breeze. If you happen to have some questions or suggestions, don’t hesitate to mention it in the comment section below.